Depending on who you ask, few things are more relaxing than taking a bath. Whether at the end of a long day or the beginning of one, sinking into a tub filled with warm water can help your cares melt away. The best soaking tub is just what you need if you want to spend an hour or so sitting in the bath. We rounded up a few models in different styles and price points and evaluated the pros and cons of each. 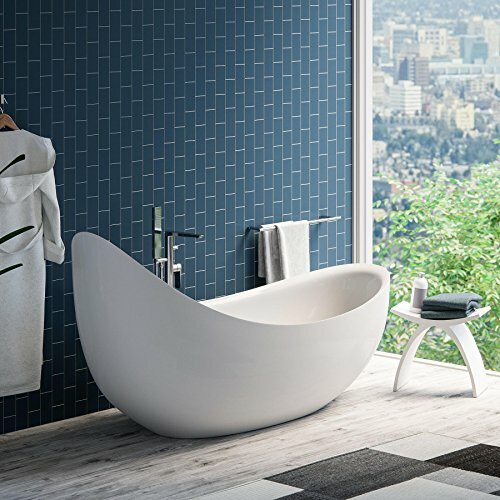 What makes the best soaking tub different from a regular old tub? We have to say it’s the depth of the tub and the amount of water it holds. Our picks ranged from 13 inches to 19 inches in depth. Our top pick, the Maykke Vale, was 19 inches deep. It was also 53 inches across and held over 120 gallons of water. The pick with the shallowest depth was also from Maykke, the Hialeah model. What that tub lacked in depth it made up for in length, though, as it measured 79 inches long. Most of the tubs we reviewed are made of acrylic. Acrylic is ideal for soaking tubs because it’s lighter weight compared to other tub materials. It also has insulating properties that help it retain heat for longer than cast iron or other types of a tub. The only tub on our roundup that wasn’t made from acrylic was the one from American Standard, which was made from Americast, a type of enamel coated steel. The American Standard tub was also the only alcove model on our list. The rest were all freestanding. The Maykke Vale soaking tub seems to be modeled off of Japanese soaking tubs. It’s round and measures 53 inches in diameter, meaning it’s large enough to accommodate at least two people. The tub is about 19 inches deep and has smooth sides that make it easy to climb in and out. The smooth sides also make the tub comfortable to sit in. It’s made from acrylic that is finished with a coating that helps improve its insulation. The material of the tub consists of eight layers, which makes it extra durable. The one substantial drawback we noticed about the Maykke Vale is its size. If you’ve got the room for a 53-inch in diameter bathtub, then we say go for it. But we’re guessing that the average person doesn’t have that type of space in their bathroom. People who installed the tub love it, with a few warnings. One person noted that it does require a water heater with an 80-gallon capacity to fill the tub fully. That same person also noted that the tub retains heat well, so you’re able to soak for at least an hour in a warm bath. Super big — can easily accommodate more than one person. Also ideal for taller people. The acrylic material retains heat well. Needs a lot of water. Your water heat might not be up to the task. Has a large footprint and won’t fit in most bathrooms. The Woodbridge soaking tub holds about half as much water as the Maykke Vale, but it’s still a soaking tub. We’d recommend it for one person because of its size and shape. 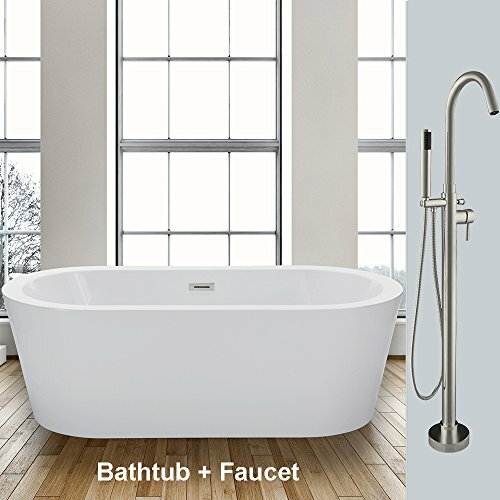 Another notable feature of the Woodbridge tub is that it comes with a tub filler or faucet. With most soaker tubs, you need to buy the filler separately. That can be both a good and bad thing. On the one hand, you get to choose the design of the filler separate from the design of the tub. On the other hand, having to purchase the faucet or filler separately adds to the cost of your bathroom renovation or remodel. So for simplicity’s sake, we like that the Woodbridge tub includes a faucet. 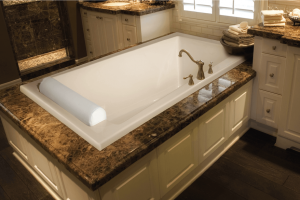 As far as being a soaker tub, the Woodbridge model is a bit more shallow than others. You can fill the tub to a depth of 14 inches or so, and it will hold about 60 gallons. It’s not the deepest of tubs, but it might be ideal for some people based on the amount of space they have in their bathrooms. People who’ve used the tub have been pretty happy with it, with a few noting that it looks similar to models you’d find at high-end bath and home decor stores. Acrylic material is double walled and retains heat well. Depth is a bit shallow. Some people noted issues with the drains on their tubs. 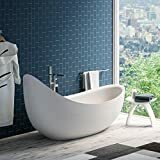 Just because you have to choose an alcove or standard bathtub for your bathroom doesn’t mean you can’t get a soaking tub. The American Standard Cambridge is an alcove style tub with a finished apron (the side of the tub that isn’t against a wall). It can hold water to a depth of 14 inches, similar to the depth of the Woodbridge tub. Unlike the other soaking tubs in our roundup, the American Standard isn’t made from acrylic. Instead, it’s made from a proprietary enamel coated steel. The material makes it lighter than cast iron tubs and a bit more durable. The one drawback is that the steel doesn’t retain heat as well as acrylic does. Those who’ve tried out the American Standard Cambridge have been pretty happy with its durability and overall sturdiness. Several have noted that it’s deeper than a standard bathtub but costs about the same. Please note that if you’re going to install an alcove tub, you need to pay attention to the drain location. The Cambridge is available in both left-hand and right-hand drain models. Proprietary Americast material is durable. Works in most standard bathrooms. It’s an alcove style tub, so it’s not exactly glamorous. It’s smaller than other soaking tubs. 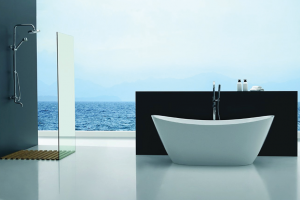 If you want your soaking tub to look dramatic, the AKDY freestanding soaking tub might be the one for you. It has sharp, angular lines and is very eye-catching. The tub holds just under 100 gallons of water and has a sitting area that measures 43 inches by 20 inches. Although it’s primarily designed for one person, you can most likely fit two in, especially if you’re bathing small children. The tub is made from acrylic and has a double-walled construction that helps it retain heat. 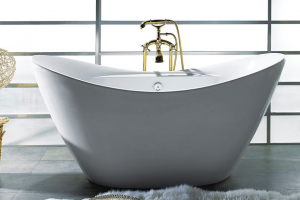 For the most part, people who’ve bought the tub are happy with it, particularly with its good looks and performance. One concern a user had was that the tub was difficult to secure to the floor and that there is a risk of it tipping over. Has a relatively large seating area. The acrylic material helps the tub retain heat. Might be a tipping hazard. Overflow is made of chrome. Talk about an exciting design – the MAYKKE Hialeah tub has a slipper shape, meaning that the back portion of the bathtub is considerably higher than the front. The elevated slipper portion of the tub means that you have a place to rest your head while relaxing in it. It also means that you can only really face one way while in the tub and that the tub can only fit one person at a time. Although it describes itself as a soaking tub, the tub only has a depth of about 13 inches and can hold up to 66 gallons of water, which seems a bit low for a soaking tub. People who’ve tried out the Hialeah soaking tub have been mostly struck by its appearance, with a few calling it a beautiful tub. Others have been happy that the tub can accommodate tall people — it measures 79 inches in length. High back makes for comfortable relaxing. Water capacity and depth seem low to us. High back does limit where and how you can sit in the tub. What is a Soaking Tub? If you wanted to be fussy, you could argue that any tub is a soaking tub. After all, most tubs are meant for soaking in so that you can get clean. But a soaking tub usually has distinct features that set it apart from standard tubs. One key feature is the depth of the tub. Generally speaking, the best soaking tub is going to hold a lot more water than your run-of-the-mill bathtub. The goal of a soaking tub is to help you relax and unwind by sitting surrounded by warm water. You can’t relax or sit comfortably in most standard size tubs. 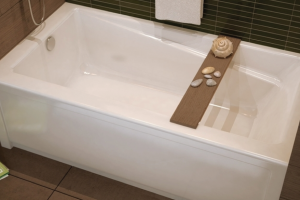 Some soaking tubs have additional features to increase comfort, such as armrests and backrests. While investing in a soaking tub or including one in a remodel or renovation of your bathroom might seem like a great idea, there are a few things you should know first. The biggest issue we can see with a soaking tub concerns the amount of water it uses. 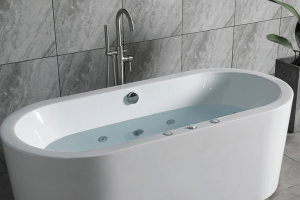 While some tubs call themselves soaking tubs but don’t hold that much regarding volume, others are quite deep and do hold gallons and gallons of water. A lot of water use can mean an increase in your water bills. It can also mean that it’s difficult to keep the water warm as the tub fills up. Depending on the volume of your soaking tub, you might need an additional water heater for its exclusive use. Another issue with a soaking tub has to do with its weight. As you know, what is heavy. When you fill a tub with over 100 gallons of water, it’s going to be pretty heavy. Add to that the weight of the tub itself and your floor might not be able to handle it. 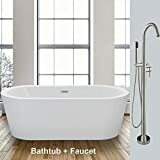 Are Other Tub Options Available? So, is a soaking tub the right pick for you and your bathing needs? It helps to take a look at the other tub types out on the market. Standard Tubs. 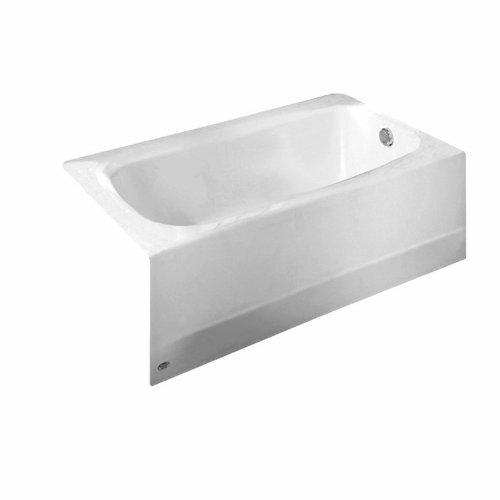 A standard tub is usually on the small side and is designed to fit into a recess between three walls of a bathroom. It’s often your basic, no-frills bathtub. Freestanding Tubs. Freestanding tubs include vintage claw foot tubs and other basins that don’t need support on any side. They can take more space than a standard tub and can also be soaking tubs in some cases. Walk-In Tubs. Walk-in tubs are usually meant for people who have mobility issues. They have a door that opens so that you can walk in, fill up the tub and bathe. Whirlpool Tubs. In some ways, a whirlpool tub is a soaking tub, with the addition of jets that help move the water around. 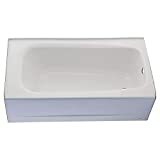 Whirlpool tubs can also be considerably smaller than standard soaking tubs. 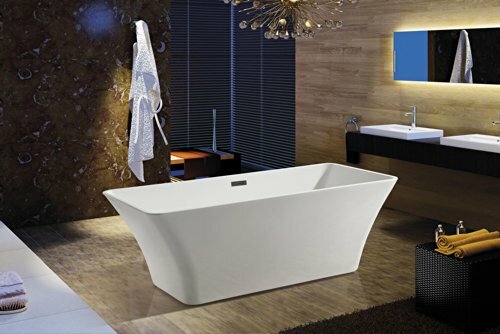 If you’ve got the space and you’re in the market for a real-deal soaking tub, we have to recommend the MAYKKE Vale 53″ Modern Round Acrylic Freestanding Bathtub over the rest. For one thing, the MAYKKE Vale is the only tub on our roundup that seems designed with luxury and relaxation in mind. Sure, it is a ridiculously large tub, and it requires a lot of water. But if you want to unwind and forget the cares of the day, it’s the best soaking tub for the job.